February 27, 2014. 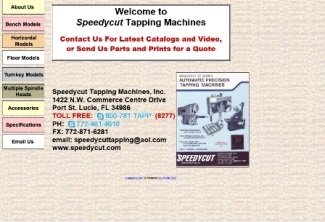 Rockford, IL based corporation, High Performance Holdings, Ltd (HPH), announced today the acquisition of substantially all of the assets of Speedycut Tapping Machines, Inc of Port St. Lucie, Florida. The Speedycut brand is now added to the Rockford Drill Head, Ettco Machine Tool, Procunier and Universal Automatic brands enhancing what is already the most complete offering of drilling and tapping solutions in the North America. HPH goes to market under the Rockford-Ettco Procunier name and operates facilities in Rockford, IL and Lakeland, FL. The company’s product line also includes a division manufacturing automotive aftermarket fluid exchange equipment sold under the Wynn’s and QMI brand names. Speedycut, founded in 1968 serves the stamping, die casting, screw machine, and fastener industries with Speedycut and Brother’s secondary tapping machines and parts. This acquisition will become part of the operations in Lakeland, FL. HPH goes to market under the Rockford-Ettco Procunier name and operates facilities in Rockford, IL and Lakeland, FL.